– for reminding America why our health care should absolutely not be traded on the NYSE. And, in case you were wondering, I didn't let any Trump/Macy's Parade balloons jokes or Thanksgiving turkey/Middle-Eastern Turkey East jokes get through this week. Except for Glenn McCoy. And here's a reminder: your humble scribe is nearing the end of Day Two of the p3 Annual "Little Drummer Boy" Competition. No wagering please – this is for exhibition purposes and the joy of the sport only. Today's toons were selected by a platoon of multinational tax-dodge experts from the week's offerings at McClatchy DC, Cartoon Movement, Go Comics, Politico's Cartoon Gallery, Daryl Cagle's Political Cartoons, About.com, and other fine sources of toony goodness. p3 Picks of the week: Mike Luckovich, Signe Wilkinson, Robert Ariail, Steve Benson, Jeff Danziger, Matt Davies, Clay Jones, Dan Wasserman, Matt Wuerker, and Monte Wolverton. p3 Best of Show: Lisa Benson. p3 Legion of Merit: Stuart Carlson. p3 "I Get It" Award: Joel Pett. p3 Croix de Guerre: Tim Eagan. p3 World Toon Review: Heng (Singapore), Terry Mosher (Canada), and Luojie (China). Ann Telnaes moves up the gift return timeline by a few weeks. Mark Fiore is thankful for crayons and future Fox News pundits, in that order. Tom Tomorrow salutes the land of the spree and the home of the knave. Keith Knight wasn't by any means the first gentleman toonist to get there, but it did make me chuckle when I pictured the Bethlehem inn as part of the Trump hotel chain. Reuben Bolling salutes the latest ISIS recruitment drive. Red Meat's Ted Johnson relies on a simple home (improvement) remedy. The Comic Strip Curmudgeon marks the holiday weekend with references to the Kantian imperative and centaur erotica. Comic Strip of the Day pays tribute to little weasels, futile gestures, and a comic strip he didn't understand at the time. Ex-Oregonian Jack Ohman puts the American holiday season in its proper perspective. 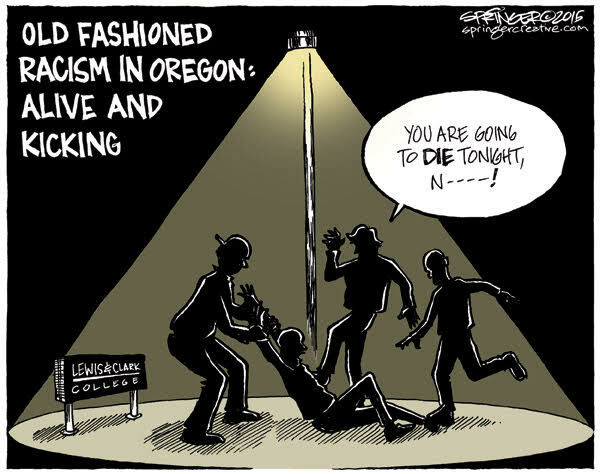 Possibly Ex-Oregonian Jen Sorensen looks at Thanksgiving, past, present, and future. Matt Bors points out – quite correctly – that it's a fine line between the drunken, opinionated boor at the end of the bar and . . . well, you'll see. Jesse Springer is discouraged – and why wouldn't he be? – by the recent assault on the campus of Lewis & Clark College.